New dock 2018 season!! Old red dock gone!!! New 12 x 24' deck! Lakeside view of cottage! Dining table with 8 chairs. Picnic table in yard! Roadside view of cottage - 1 main floor bedroom with Queen size bed- 2 bedrooms and full bath upstairs! 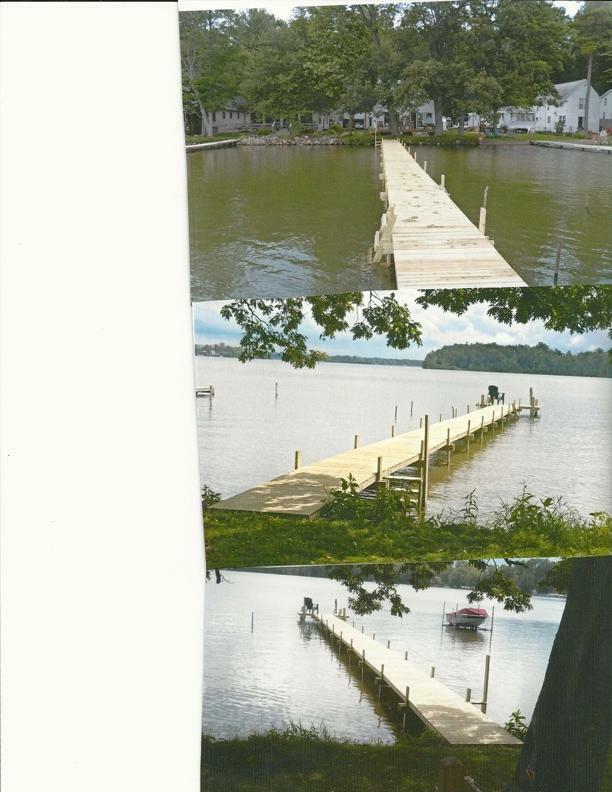 Red dock gone - new dock 2018 season! If you bring a boat, your boat trailer will count as 1 of the 4 vehicles you are allowed to park on property! Parking for 2 cars(or boat trailer) end to end along side of garage 1 car inside garage - additional car can be parked in front of garage (or 2 small cars) . Open Floor Plan - Kitchen open to dining room and living room- Ele. stove - dishwasher - microwave - side-by-side refrid. Living room with 2 sofa's and chair - CABLE TV - & WiFi - new smart TV 2018! Bedroom Main Floor! Queen Size Bed ! Full bath also on this level! All linens and towels are provided! Window A/C units in ALL bedrooms PLUS living room area! Bedroom towards road - Upper Level bedroom with King Size bed for 2018! Room for a Pack-n-play if needed! This bedroom will have flat screen TV 2018! Upper Level Bedroom--bedroom towards lake- Full Size bed Plus Queen bed. Main floor bath - with 4' shower stall. Both baths have showers! This is the upper level bath also with a shower stall, no tub!! LABOR DAY 3 NITE MIN. - $850/3 NIGHT STAY! 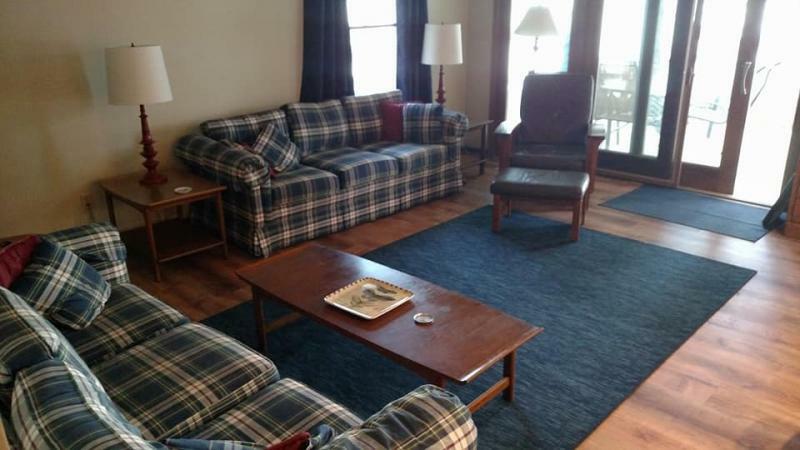 Located on the north east bay of Gun Lake, this 3BR 2 bath 1296 sq.ft. home was built in 1984 and updated last spring with new flooring, paint & window coverings throughout. A new back porch with ramp makes wheel chair access possible if needed. 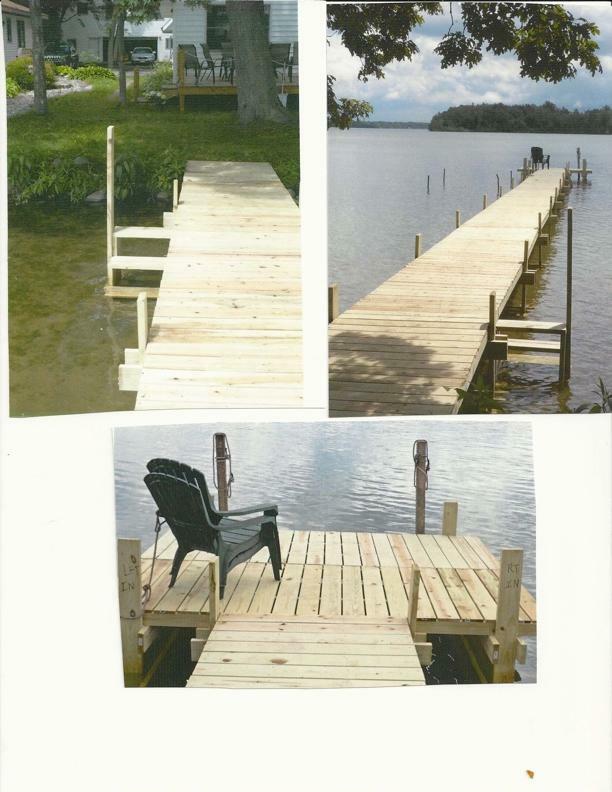 The lakefront also has a new 12x24' deck making outdoor living easy! There is one bedroom and one full bath down with two bedrooms and full bath upstairs, sleeping for a total of 8 adults. Queen size bed, full bath with 4' walk-in shower on main level. 2nd floor offers 2 generous sized bedrooms and 2nd full bath also with shower. 1 bedroom upstairs, with King size bed, 3rd bedroom with 1 full size bed and one Queen. Home will sleep 8. All linens & towels are provided! You may want to bring beach towels! All bedrooms are equipped with window A/C units as well as the main living area! 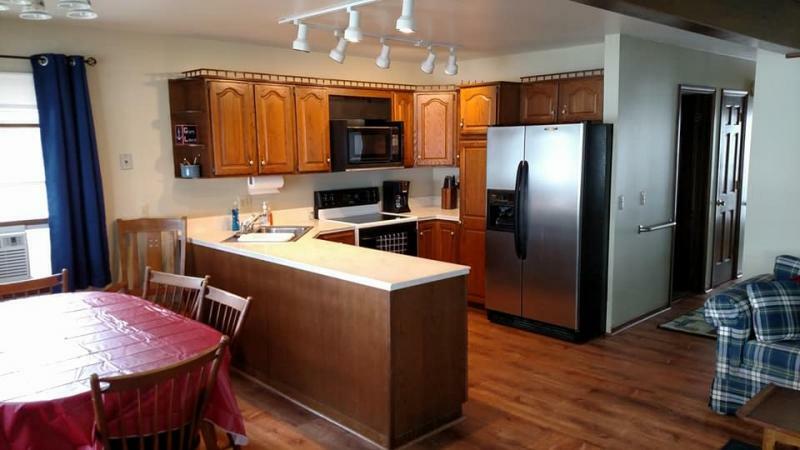 Fully equipped kitchen with electric stove, stainless steel side-by-side fridge/freezer, microwave, dishwasher - also a washer & dryer. Place settings for 12, pot & pans, all utensils, blender, toaster, coffee maker, wine glasses etc. will make cooking and dining-in a breeze! Gas Grill plus outdoor dining for 8 -Inside Dining area w/ table with seating for 8 as well. Parking - 2 cars tandem (end to end) along side of the garage & 1 car inside of garage-maybe 2 small cars behind garage or 1 larger. If you bring a boat, boat trailer will count as one of the cars you will be allowed to park on property. Total of 4 vehicles ONLY! DAMAGE DEPOSIT: $200 - Deposit will be refunded within 15 days of your departure with all being left as you received it! This home does have a parking limitation of 4! vehicles ONLY! Both washer & dryer new in last year!